Recently, the venerable firm Hardy of Alnwick, England-famous for more than a century for its elegant fishing reels but generally considered the maker of old-fashioned or overpriced rods-has launched a line of rods that has taken the fly-fishing world by surprise. Made from "sintrix" (for silica nano matrix), they are as much as 30% lighter and 60% stronger than existing carbon-fiber rods, the company says. But they are not cheap yet: A typical sintrix rod will set you back $700. Earlier this month, one of the new Hardy rods won a competition organized by the Yellowstone Angler, a famous tackle shop, for the second year running. 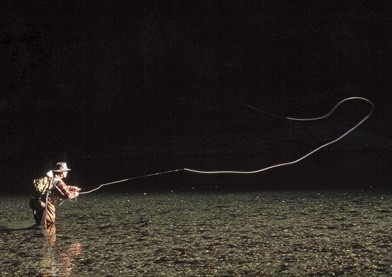 Fly rods-whose look falls somewhere between a stick and long whip-aspire to an almost impossible combination of stiffness, flexibility and strength. A 15th-century German treatise shows how hard this was to achieve with natural materials: a slender blackthorn or medlar shoot was fixed to a tapering ash or willow stick after months of curing, drying and heating. By the 19th century, fishermen were using lancewood, bamboo and whalebone rods, soon joined by "greenheart" wood from a South American hardwood tree. Then came "split cane"-a bundle of slender fibers of bamboo, bound to make a whippy but strong rod-that dominated design until the 1970s, fighting off the challenge of glass fiber. Then, as with oars and golf clubs, split cane quickly gave way to carbon fiber, made from polymers that have been stretched, oxidized and heated until all that's left is ribbons of mostly graphite glued together with resin. The fibers are amorphous, meaning that, although mostly parallel with the length of the rod, they twist and double back on each other. Other sporting objects like baseball bats are being transformed by carbon nanotubes, molecular cylinders of carbon atoms that are among the strongest materials yet known, capable of enduring the tension of a weight of 11 tons on a cable with a millimeter-square cross section. But they're too inconsistent and stiff for a fly rod, Hardy concluded. When Richard Maudslay, descendant of the inventor of the lathe, became chairman of Hardy after a career in power engineering, he brought the idea of "finite element analysis," a mathematical tool that simulates stresses in materials so that new ideas can be quickly tested. Until then, innovation in fishing rods consisted in asking expert fishermen what they wanted next. Norman Fleck of Cambridge University used the finite-element method to determine that what was needed was material with better properties in compression. Working with 3M, Hardy tried impregnating the resin with 100-nanometer silica spheres, in effect lubricating the carbon fibers with minuscule bearings. The result was a spectacular combination of strength to resist a big fish and flexibility to whip a length of line out to land softly on the water. Science has moved on, and nanoparticles as small as 2 nanometers are now in use, so Mr. Maudslay wants to do it again. He argues that improvements in materials, from steel to plastics to silicon, are the keys to understanding the industrial revolution. Fixated by bits and bytes, we sometimes forget the importance of innovation in "stuff."